David Apatoff, ever game, wrote a forthright comment in response to my last post–a characterization of the Gary Panter dust-up at David’s blog as indicative of a culture of resentment that seems to animate certain quarters of the illustration field. My aim in this go-round is to suggest a) a standard of care, so to speak, for criticism, and b) identify bitterness as such when it shoots up out of the ground of a partisan's prose. In a day or two, I will offer a third installment, devoted to an analysis of the cultural sources of the buried conflict which has spawned certain of these resentments. The impetus for my last post, hauled from my written-but-not-posted bucket, was a February 2009 offering by David on the subject of Kerry James Marshall. Marshall is an African-American artist who first acheived prominence in the 1990s for large scale memory paintings of life in urban renewal projects in the mid-sixties. He has since gone on to produce a variety of works, most referencing black popular culture. If you spend time in museums–especially comprehensive ones like the first- and second-tier institutions in large American cities that made their fortunes early enough to gobble up the best available European art at good rates–it is possible to develop relationships with a wide range of individual works of art. I visit specific paintings and artifacts in a variety of museums in the East and Midwest whenever I can. For example, I always visit John Singer Sargent’s Wyndham Sisters (1899; above) in the American Wing at the Metropolitan. In Cleveland, I always go to see Bellows’ Stag at Sharkey’s. In St. Louis, I visit the roomful of Max Beckmanns, the late Gustons (on the extremely rare occasions when they’re up), a set of Olmec reliefs, and a Kerry James Marshall painting that I really admire titled Watts 1963. Among others. The Marshall painting (below) hangs in the upper galleries of the St. Louis museum, which feature modern and contemporary art. (Alas, the Marshall must spend the business hours of every day within aural range of a Bruce Nauman video. Grating.) As a question of ambition and pure visual presence, the painting overwhelms its neighbors, which have included a Brice Marden, a work I also admire (above). Marshall’s in-the-projects paintings articulate spaces both physical and cultural. The unstretched grommetted canvases, which recall sideshow signage, offer hope and reach but foretell threats, too. Space precludes a full discussion, but these are really serious works of art, open-hearted yet cunning and rueful. 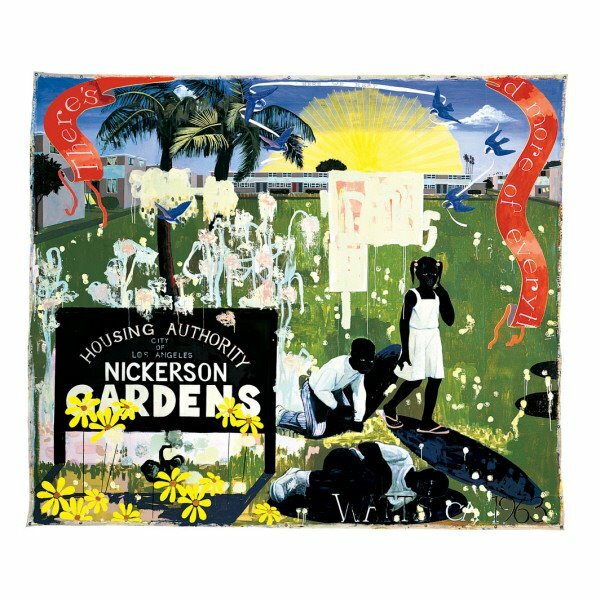 I gain nourishment from the Watts painting (set in Nickerson Gardens) painting every time I’m with it. I love this thing. Artist Kerry James Marshall is a certified genius. The MacArthur Foundation confirmed it when they awarded him their $500,000 genius award. But don't take the MacArthur Foundation's word for it. His work was also awarded places of honor in the Whitney Museum biennial, Venice Biennale, and the prestigious German Documenta show. Marshall's paintings sell for $400,000 to prominent museums and collectors. People of great stature and prominence who pride themselves on their taste have bestowed upon Marshall almost every form of recognition that our society offers. Apatoff then presents a sonnet by Edna St. Vincent Millay, (reproduced in part below) offered ironically. "Your roof is low for me — the fault is mine." Up to this point, David has presented no argument. He has reproduced images by Marshall without providing bibliographical context, or even titles. (Most are panels from Rythm Mastr, a 1999 comic book project that involves an African pantheon and a futurist science fiction adventure. Interview transcript here. I saw some of this material in an exhibition at the Contemporary in Chicago some years back. I found it less compelling than the large scale paintings.) Apatoff's strategy (I gather) is to show some artwork with an ironically celebretory text, calculated to mock, without bothering to present a case for his implied naked-emperor conclusion. The approach can only be called methodologically smug yet logically weak. I also believe that Marshall does not draw or paint well, that his compositions are mediocre and that his themes, while occasionally clever, are rarely profound. On what basis does he make this judgment? By looking at some jpegs? He does not tell us. We do not know whether he has engaged any such works (drawings? paintings?) in person. We're not really given a sense of what it might mean from Mr. Apatoff's perspective to draw or paint "well". Rather, we are offered an unsupported, flip opinion. And what about the objection that Marshall is “rarely profound”? In which specific case has Marshall’s work achieved profundity, and how? How often, say, was Matisse "profound"? Twenty percent of the time? Sixty-five? What might be an acceptable figure for a profundity average? And mediocre compositions? Really? This is cheap writing; it demeans its author. I think his work is of the quality of a mid-tier comic book artist-- both in form and content. Yet, the arbiters of taste have proclaimed him a "genius" whose pictures are worth $400,000 apiece, while comic artists everywhere try to eke out a living. They spit on our values! I would have less of a grievance if comic artists weren't treated with such disdain by the same audience. Begrudged success as a "grievance." Hmm. And as for disdain: there’s plenty of disdain here, all issuing from the writer. The imagined disdain to which David refers-–that, apparently, of gallery-goers, curators, various arty types--hasn't been established. In fact there is no such disdain. There is disinterest. People follow what they follow, and comic books appeal to a pretty narrow demographic. Truly, those folks looking at Kerry James Marshall, including those sitting on review panels and granting agencies, are thinking about other things altogether. If Kerry James Marshall wants to do a comic book, fine, it’s an art project. Beyond that? These folks do not care. And that, finally, is what’s painful to the constituency David purports to represent. Disdain takes effort. That would be flattering, in a way: they fear us enough to hate us! But disinterest? That's just a sensible response to boredom. Nothing happening here. . . The condition of invisibility that Ralph Ellison describes [in 'Invisible Man'] is not a kind of transparency, but it's a psychological invisibility. It's where the presence of black people was often not wanted and denied in the American mindset. And so what I set out to do was to develop a figure or a form that would represent that condition of invisibility, where you had an incredible presence, but there was a way in which you could sometimes be seen and not seen at the same time. –Kerry James Marshall, on the painting Our Town, shown above. Next: I’m going back to visit the Watts painting tomorrow, just to reboot. In a day or two, Illustration and Resentment 3. And then I'll be quiet.